Pvt. Farrell Vice was born on November 21, 1947. He lived in the Henry community and attended Henry High School. He was an affable boy growing up who worked hard to help his family in their farming and dairy operations. He also earned money by baling hay with local farmers. 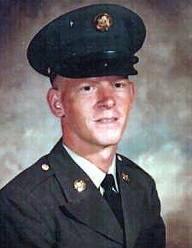 Farrell was in the U. S. Army as a SP4. Farrell was awarded the Silver Star for acts of valor in Vietnam. He was tragically killed May 24, 1969 at age 21. At the time of his death, he was survived by his wife Carolyn Vice.